•	The largest festival of democracy in the world will begin from 11th April 2019 when India goes to polls to elect the 17th Lok Sabha of the country. 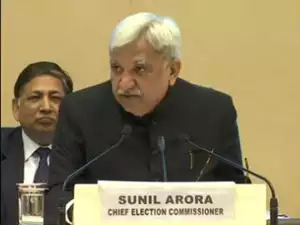 •	Chief Election Commissioner Sunil Arora announced the poll schedule in New Delhi. 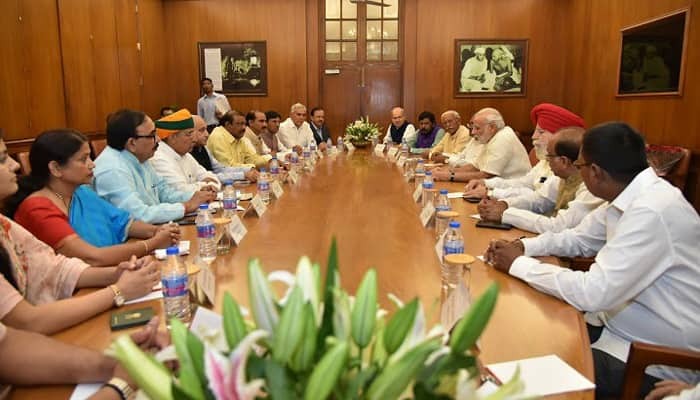 •	Ninety crore electorates of 29 states and 7 Union territories will elect 543 Lok Sabha members in seven phases from 11th April to 19th May. •	Simultaneously, Assembly elections in Andhra Pradesh, Odisha, Sikkim and Arunachal Pradesh will also take place. •	The Model Code of Conduct has come into force in the entire country with the announcement of the polls. •	The counting will be held on the 23rd of May. Twenty-two states and Union Territories will have single phase elections, while 4 states will go to polls in two phases. •	States undergoing three phases are Assam and Chhattisgarh, and Jharkhand while Madhya Pradesh, Maharashtra and Odisha will have four phase polling. •	Jammu and Kashmir will have five phases and West Bengal, Bihar and Uttar Pradesh will have seven phases. •	In the first phase, 91 Parliamentary constituencies in 20 states and in the 2nd phase 97 Parliamentary constituencies in 13 states will go to polls. 115 constituencies in 14 states will go to polls in the third phase while 71 constituencies in 9 states will go to polls in 4th phase. •	In the 5th phase, 51 constituencies in seven states and in the sixth phase 59 seats in 7 states will go to polls. In the last phase, 59 constituencies in 8 states will go to polls. •	Jammu and Kashmir will not be held with the Lok Sabha elections. •	Election Commission has decided to appoint three special observers for effective monitoring of Lok Sabha polls in Jammu and Kashmir. •	The 34th edition of Aahar - the International Food and Hospitality Fair commenced in New Delhi . •	The five-day fair, organised by India Trade Promotion Organisation, ITPO, features wide range of food products, machinery, food and beverages equipment, hospitality and decor solutions, confectionery items from over 560 participants from India and foreign countries. •	The foreign participants in the fair are from countries including China, Germany, Hong Kong, Italy, Indonesia, Japan, Russia, Spain, USA and UK among others. •	PrimeMinister Narendra Modi visited Kalaburagi in Karnataka and Kancheepuram in Tamil Nadu where he launched various development projects. •	The Prime Minister dedicated the Employees State Insurance Corporation (ESIC) Hospital and Medical College, Bengaluru to the nation, through the unveiling of the plaque. •	He inaugurated the Super Specialty Block of KIMS in Hubali, the Income Tax Appellate Tribunal building in Bangalore and the Women’s Hostel for Students from North Eastern Region at Bangalore University, through the press of button. •	Foundation stone for the resitement of BPCL depot Raichur to Kalaburagi was also laid by the Prime Minister through the unveiling of plaque. •	He also interacted with the beneficiaries of Pradhan Mantri Jan Arogya Yojana: Ayushman Bharat. 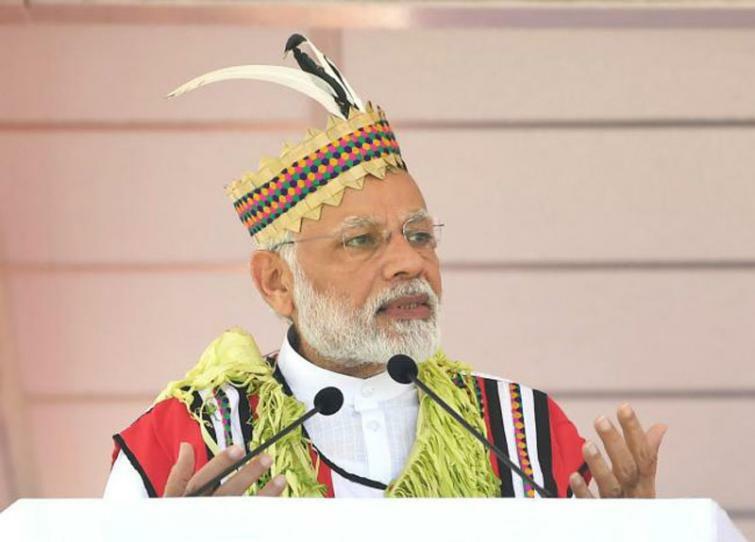 •	PM Modi launched various National Highway projects, including the foundation stone for the four laning of NH-45C from Vikravandi to Thanjavur and the six laning of Karaipettai – Walajapet section of NH-4. •	He dedicated the 5 MMTPA capacity Ennore LNG Terminal to the nation. The Liquefied Natural Gas (LNG) terminal will help in meeting the LNG demand in Tamil Nadu and neighboring states. •	He also dedicated the electrification of Erode-Karur-Tiruchchirapalli and Salem-Karur-Dindigul railway lines to the nation. •	He announced that the Chennai Central Railway Station would be renamed after former Tamil Nadu Chief Minister MG Ramachandran. •	He also unveiled the statue of Dr. MG Ramachandran at Dr. MGR Janaki College of Arts & Science for Women, Chennai through video link. 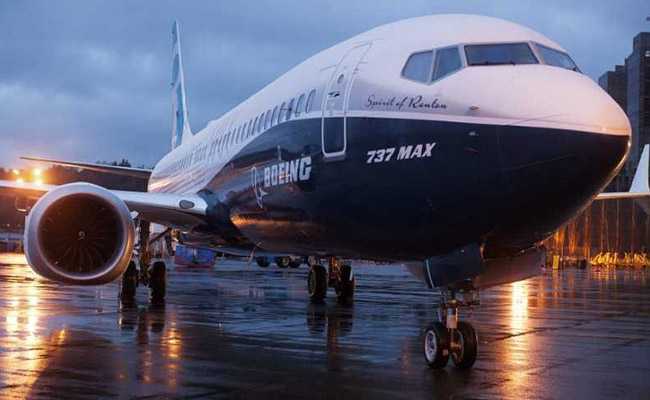 •	Government has barred Boeing 737-Max 8 aircraft from entering the Indian airspace from this afternoon in the wake of the plane crash in Ethiopia, killing 157 people, including four Indians. •	This was second such crash involving 737 MAX 8 aircraft in less than five months. •	The Ministry of Civil Aviation said that no Boeing 737-Max 8 aircraft will be allowed to enter or transit Indian airspace. •	Earlier, the Directorate General of Civil Aviation, DGCA, took a decision to ground all Boeing 737-Max operations of domestic carriers. Spice Jet has around 12 Boeing 737 Max 8 planes in its fleet and Jet Airways five. •	Union cabinet approved a scheme to rebate all state and central embedded taxes to support the textile sector and make it more competitive. •	It will enable the government to various measures for making exports of apparel and made-ups zero rated. It will also ensure equitable and inclusive growth of textile and apparel sector. Cabinet approved the proposal of Airport Authority of India (AAI) for surrendering encroached AAI’s land measuring 106.76 acres at Bhopal Airport to Madhya Pradesh government. The state government has in turn handed over 96.56 acres of land which is adjacent to existing land to Bhopal Airport and the remaining will be made soon. 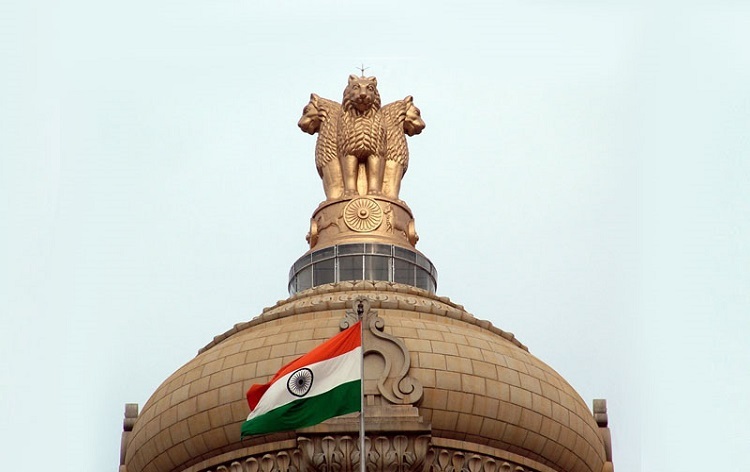 Cabinet has approved the proposal for creation of the Post of Technical member in Securities Appellate Tribunal (SAT), Mumbai which will facilitate creation of an additional bench in SAT for speedy disposal of appeals. Union Cabinet approved National mission on Transformative Mobility and Battery Storage which will finalise and implement strategies for transformative mobility and Phased Manufacturing Programmes (PMP) for electric vehicles, batteries and their components. Union Cabinet approved the proposal for release of ‘The Central Educational Institutions (Reservation in Teachers’ Cadre) Ordinance 2019 considering the college/University as a unit instead of subject/department. It will attract eligible talented candidates and improve teaching standards. Cabinet approves the grant of Ex-servicemen Contributory Health Scheme (ECHS) facilities to World War II veterans, Emergency Commissioned Officers (ECO), Short Service Commissioned Officers (SSCOs) and pre-mature retirees. They will get the benefits of cashless medical treatment under ECHS facilities. Cabinet approved the ‘Flood Management and Border Areas Programme (FMBAP) for Flood Management Works in entire country, river management activities and works related to Border areas for the period of 2017-18 to 2019-20 with an outlay of Rs. 3342.00cr. Cabinet approved continuation of National AIDS Control Programme IV (NACP-IV) beyond 12th Five year plan for a period of 3 years from April 2017 to March 2020 with a total outlay of Rs.6434.76 cr. Cabinet approves the construction of a 3rd Railway line between Narayangarh in West Bengal and Bhadrak in Odisha (155kms) on South Eastern Railway (SER) with a total cost of Rs.1866.31 cr. The construction will be completed during year 2023-24. •	Cabinet approved the Investment in 2X660MW Khurja Super Thermal Power Plant (STPP) in Bulandahahar, Uttar Pradesh at an estimated cost of Rs.11089.42 cr. Cabinet approved the Investment approval for 2X660MW Buxar Thermal Power Project in Buxar, Bihar with an estimated cost of Rs.10439.09 cr. The project will be implemented by SJVN Thermal Private Limited. Cabinet approved the Investment sanction for acquisition of M/s Lanco Teesta Hydro Power Limited (LTHPL) and execution of balance work of the Teesta Stage-VI HE Project by NHPC limited in Sikkim. The estimated cost is Rs.5748.04 crore for the project. Cabinet approved the Investment in construction of Kiru Hydroelectric Project (624MW) by M/s Chenab Valley Power Projects Private Limited (M/s CVPPL) in Jammu and Kashmir with an estimated cost of Rs.4287.59cr. Cabinet approved the recommendations made by Group of Ministers (GoM) relating to stressed power projects including grant of coal linkage for short-term Power Purchase Agreements (PPA). Cabinet has given its approval for funds amounting to Rs.270cr towards interest subvention for a loan amount of Rs.12900 crore by the bank to the sugar mills. It aimed at enhancement and augmentation of ethanol production capacity. In order to boost regional air connectivity infrastructure, the Cabinet approves Rs.4500cr to revive and develop ‘un-served and under-served’ airports across the country. •	Government of India with a view to boost to export of farm commodities to certain countries in Europe and North America introduced a scheme for providing financial assistance for transport and marketing of agriculture products. •	The Government will reimburse a certain percentage of freight charges and provide assistance for marketing of agricultural produce under this transport and marketing assistance scheme. •	The scheme would be available for exports from March 1, 2019 to March 2020. As per the Ministry, the scheme would be applicable for a period as specified from time to time. •	The scheme covers freight including both normal and refrigerated cargo and marketing assistance for export by air as well as by sea. •	The assistance shall be admissible only if payments for the exports are received in free foreign exchange through normal banking channels. 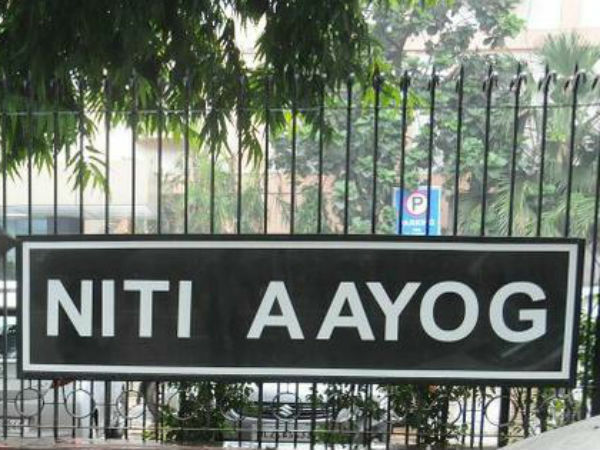 •	NITI Aayog’s list of aspirational districts for the period of December 2018-January 2019 has been topped by 3 districts of Jharkhand- Chatra, Sahibganj, and Hazaribagh. These districts are also said to have performed well in ‘health and nutrition’ parameters. •	This ranking was released by Amitabh Kant, CEO of NITI Aayog. •	In terms of education, the top ranks were attained by Sonbhadra (Uttar Pradesh), Sahibganj (Jharkhand) and Chatra (Jharkhand). •	It took into account the incremental progress made by 112 aspirational districts in the period December 2018-January 2019. •	Progress in six areas such as health and nutrition, education, agriculture and water resources, financial inclusion, skill development, and basic infrastructure is considered. •	It was launched on January 5, 2018 by Prime Minister Narendra Modi. 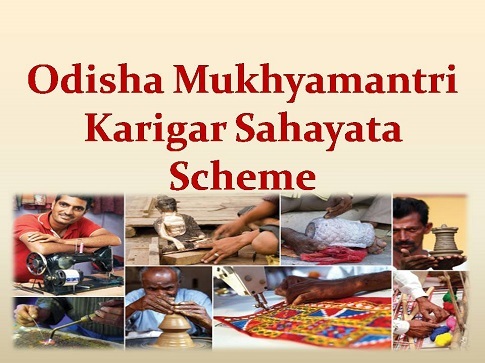 •	Odisha Chief Minister Naveen Patnaik launched the scheme ‘Mukhya Mantri Karigar Sahayata’ for financial assistance to craftsmen. The nodal department of the scheme is the Directorate of handicrafts. •	Craftsmen with 10 years of experience and having annual income below Rs.1 lakh are eligible to get an assistance of Rs.800 per month. •	For craftsmen above 80 years of age would get Rs.1000 per month allowance for those has the same experience and annual income as above. •	Annual income certificate, residence proof, experience certificate and age proof are required to produce for availing the benefits of the scheme. •	For selection of beneficiaries, a selection committee will be constituted in the district level under collectors of the respective districts. •	The Ministry of Women and Child Development hosted a felicitation event for Web Wonder Women. •	The Campaign has been launched by the Ministry of Women and Child Development, Government of India in association with the NGO Breakthrough and Twitter India. 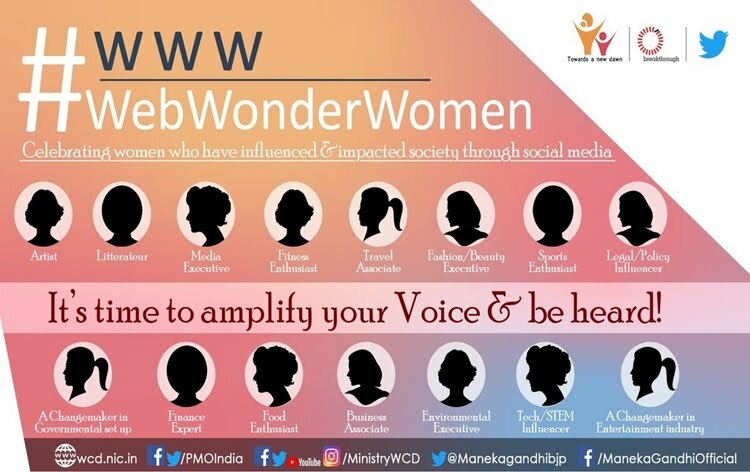 •	Through the campaign, the Ministry aims to recognize the fortitude of Indian women stalwarts from across the globe who have used the power of social media to run positive & niche campaigns to steer a change in society. •	The Campaign is aimed at encouraging, recognizing and acknowledging the efforts of these meritorious Women.